Tiny plastic particles measuring about 100 nanometres (millionths of a millimetre) are used in many products, for example, to encapsulate dye or aromatic substances or as additives to shampoos and cosmetics. Many of them land directly in sewage as soon as the products are used. Together with other plastics, for example from tyre rubber in road runoff, they end up in the water-treatment plants. But until now, it has not been possible to measure them there. Unlike larger particles (microplastics), they cannot simply be sieved out and weighed or counted. In addition, it was unclear, except in models, how much nanoplastic was retained in water-treatment plants and how much entered the environment. Now, a group of researchers from Eawag and the ETH Zurich have developed a method that enables the tracking of nanoplastics: they have produced plastic particles with cores of the precious metal palladium. These can be relatively easily analysed using standard methods. 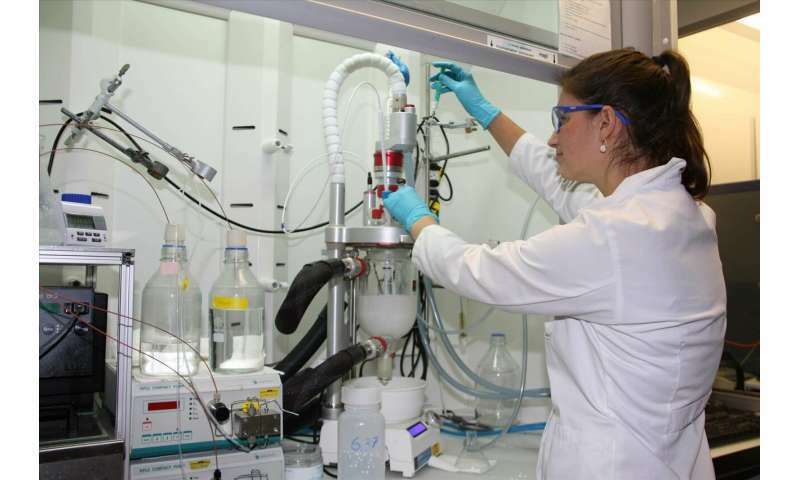 In their article published in Nature Nanotechnology, the researchers used the method in a laboratory to study the behaviour of nanoplastics in the activated sludge process of a water-treatment plant. According to project leader Denise Mitrano, the nanoplastic particles bind very quickly to the sludge flocculate, resulting in an ultimate elimination level of over 98 percent. "As long as the sludge is not spread on fields, but rather burned, as is the practice in Switzerland, very little nanoplastic material makes it into the environment," says Mitrano. This is a positive result. But Mitrano adds, "We need to know much more about the behaviour of nanoplastics. Even if only small percentages make it into surface waters, these can add up to higher concentrations downstream." She now hopes that her method, which was used on traceable particles, will quickly lead to new insights. As the palladium in the core of the nanoplastic particles is firmly bound, it is even possible to trace whether the particles produced in the laboratory are taken up by organisms, and to do controlled eco-toxicity tests. Projects using the tagged particles are already running, including a joint project between Eawag and the Zurich water utility on the retention of nanoplastics during drinking water purification.